It has become a vogue to search a soul mate through internet. The wide reach and accessibility of internet has prompted the Matrimonial Agencies to provide their services through internet as well. Hence, people have been showered with number of Indian Matrimonial Sites. But, for most of the people nobody is more trustworthy than their parents and family and hence, they are the decision maker in their life. Then is it really safe to trust a Matrimonial Site when it is a question of whole life? Are Matrimonial Sites here for business only or do they really help people in true sense? In their outlook, it is a safe medium to interact with a stranger. The compatibility of prospective couple can also be judged on the basis of horoscope matching. 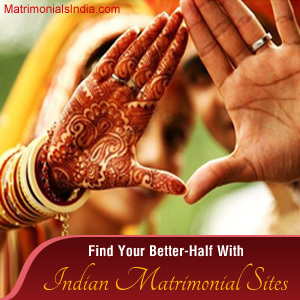 Matrimonial Sites are highly time-saving and you can find your match from any corner of world. These sites provide an opportunity for those who have settled abroad but wishing a match from India only. The previous records of these Matrimonial Sites stand by the success rate of marriages done with the help of Matrimonial Sites. Hence, these sites can be followed and trusted to find your perfect match.